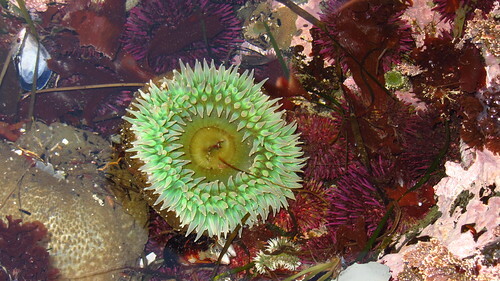 After checking out the tide pools and watching the seals lounge around on the beach through binoculars, we packed up and left MacKerricher State Park. Satiated by breakfast in Ft. Bragg and with enough groceries to get us through the day, we pedaled out-of-town toward Manchester. The route through Mendocino along Hwy 1 is absolutely beautiful. This stretch was one of my favorite parts of the trip. 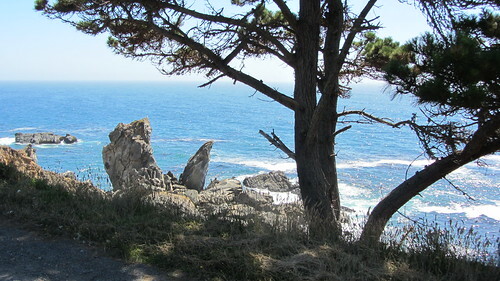 Amazing coastal vistas, perfect weather and curvy windy roads that keep logging trucks away. Most of the traffic was traveling at relatively slow speeds and the lack of shoulder didn’t bother us too much. The series of hairpin turns meant fun downhills, but also lots of climbing. The boy and I developed a pretty good rhythm. When we’d see the sign indicating a hairpin turn, he’d yell, “Tuck and Pedal! !” and we’d pedal vigorously hoping to keep momentum going into the climb that always followed. We originally planned to camp at Manchester State Park, but upon arrival, we learned that they had no potable water and no showers. Desperately needing a shower, we opted for our favorite KKKKOA chain. I annoyed the kids and Tim for the rest of the evening emphasizing my K’s as we cooked dinner in the KKKamper KKKitchen and listened to bad KKKaroke entertainment from other KKKampers. During the night we heard doves cooing above our tent and woke in the morning to a tent covered in dove KKKrap. That was the icing on the KKKake. We cleaned it off as best we could and quickly packed up and pedaled out of there. Our “neighbors” at the KOA had an amazing amount of stuff including numerous dogs and cats in a fenced off pen and a full size gas BBQ! 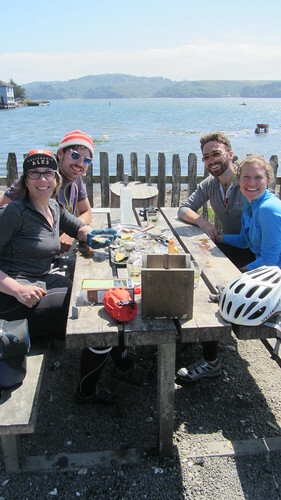 We spent another day pedaling the Mendocino and Sonoma Coasts. 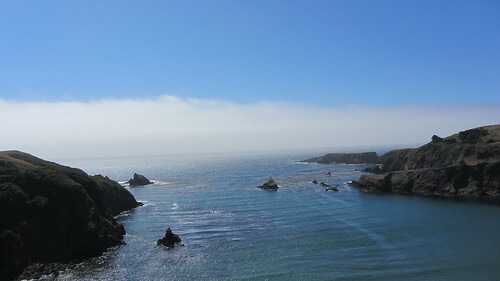 Sonoma Coast is amazingly beautiful: rugged, sparsely populated, and beautiful vistas with perfect weather for bike touring. We pedaled up more climbs and descents and honed our tucking and pedaling skills. We enjoyed the ocean views all day. We ran into “The Surfboard Dudes” after lunch and rode with them for a while. They looked like they were suffering quite a bit towing surfboards up those climbs. We also encountered lots of cows grazing behind fences and where there were no fences, cows sometimes wandered in the road. The boy loved it, we talked about cows for hours. 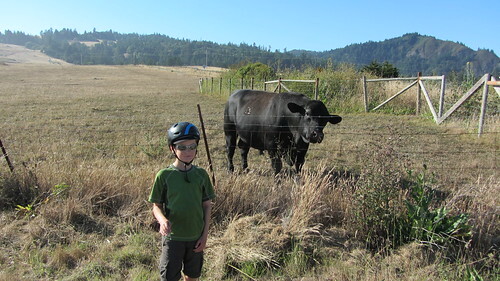 We ended up naming this big climb “Cow Hill”, and when we reached the summit, the boy wanted his photo taken with one of his bovine friends. 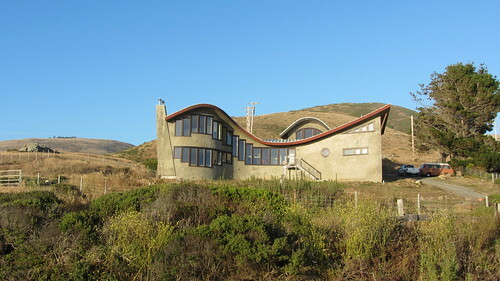 The distinctive architecture along the Sonoma Coast made the ride interesting too. We looked forward to spotting cool houses in the hills. After 71 miles of climbing and sun, we were beat. 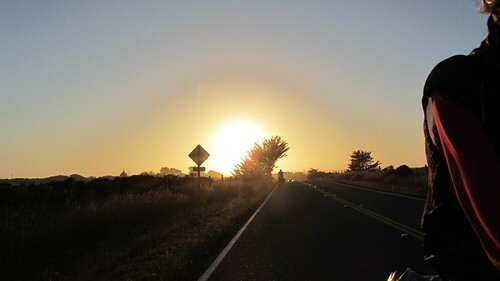 We arrived at the campground at dusk and decided to take a rest day in Bodega Bay the following day. Not much to report on our rest day, other than actual rest. And reading, and eating. After our experience in Gold Beach, I couldn’t convince anyone to go to the beach with me, so we just stayed in our sandy campsite. Bodega Dunes campground is low-key. The hiker biker campsite is pretty big and easily swallowed up the five groups who wandered in throughout the day. 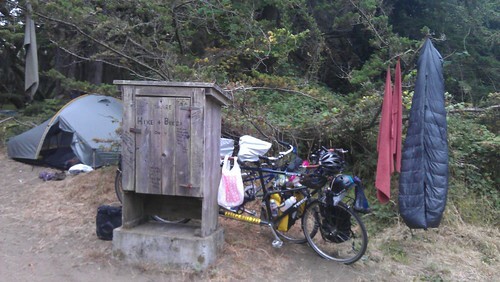 This campground also has free showers. 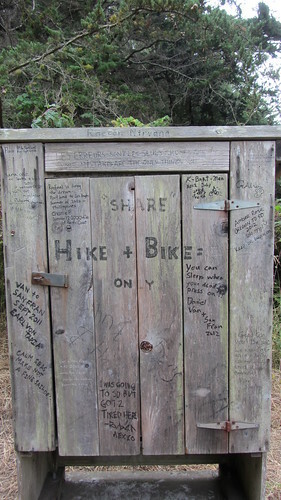 Bonus for stinky bike tourists! 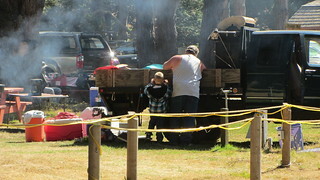 Later in the afternoon the “Tandem Family” showed up in the campground. We were so happy to see them. All eight of us went into town for dinner that evening for some fish and chips. High: Rest and seeing the “Tandem Family” again! The last day of riding, we’re almost to San Francisco. This day was all about food and pedaling. 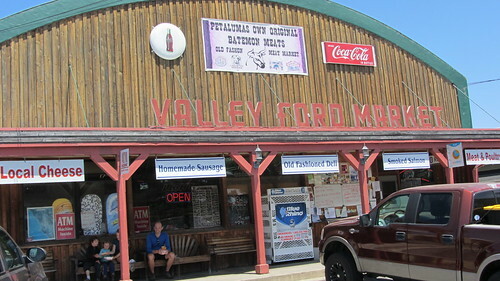 We stopped to stuff our faces with delicious lunch at the Valley Ford Market. A perfect place to get eat lunch, the store was incredible. As we were getting ready to start pedaling again “The Tandem Family” showed up! We chatted a bit and we were off. This was the last we’d see of them on the trip. 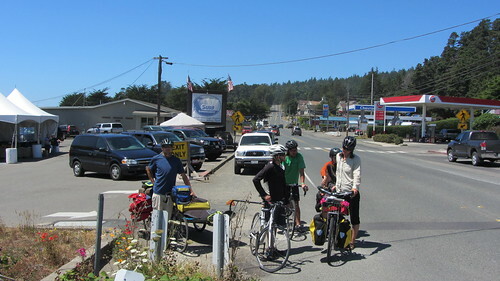 We were ending our trip in San Francisco and they were continuing on to San Luis Obisbo, South of Big Sur. We’d catch up with them in Seattle when we all returned. 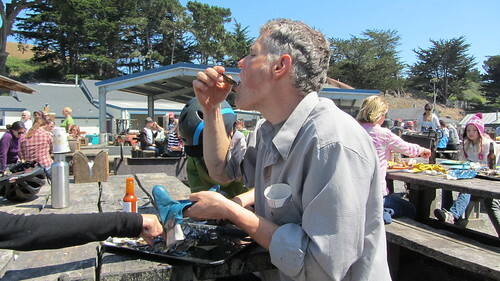 Tim had heard of Hog Island Oyster Farm from his sister who is a water quality specialist and food scientist at the University of Washington. Naturally he wanted to stop in and eat some oysters. 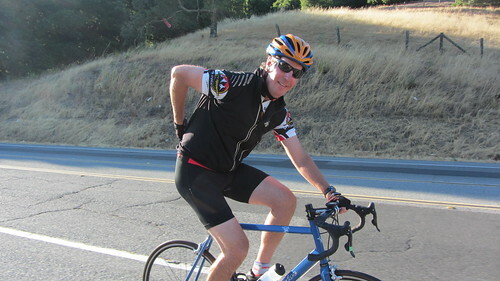 I was being a grumple pants and really didn’t want to stop, I was anxious to keep pedaling and ensure we arrived in San Rafael by sunset. But I’m so glad we stayed, what a beautiful setting. I wished we could have spent more time eating oysters (and sampling wine) on the beautiful patio. Another time, no wine for us if we want to make it to San Rafael by sunset! 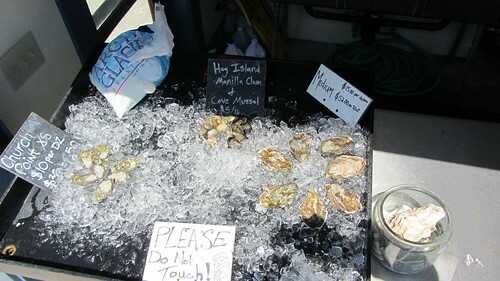 When we pulled up, we saw some familiar bikes and noticed “The Cookbook Couple” sharing oysters in the sun too! Tim and our daughter shared a dozen oysters. 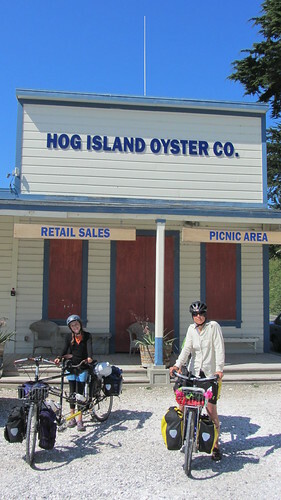 With bellies full of oysters, we got back on the bikes and continued to ride South. My good friend, Steph, whom I’ve known since first grade drove out to Lagunitas on the outskirts of Marin to greet us as we emerged from our ride through Samuel P Taylor State Park. We were so happy ( and a bit emotional) to see them and share our excitement of finishing the tour. Steph dropped her husband, Jim, with his bike and he escorted us through Marin to their house in San Rafael. Along the way, we met several people on bikes who rode with us a few blocks at a time and quizzed us about our tour. 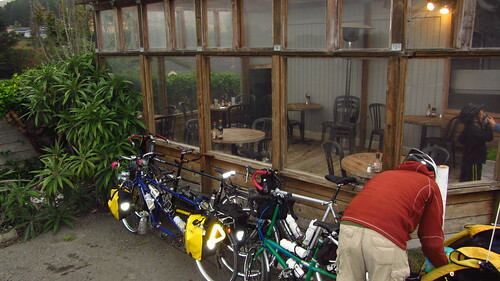 Friendly bike people in Marin! The ride into San Rafael was beautiful! 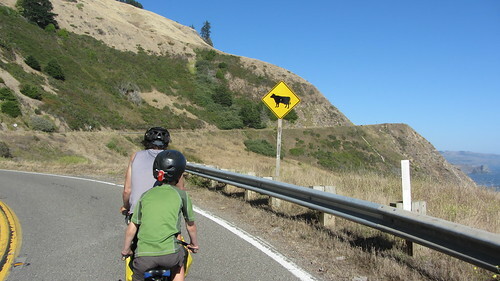 This entry was posted in bike touring, bikes, Pacific Coast Bike Tour and tagged 2012, acapaccoast, bike touring, bikes, carfreedays, family bike touring, Family Cycling, kids, MacKerricher State Park to San Rafael, OR, Pacific Coast Bike Tour, tandem, tandem bike tour, two tandem bike tour. Bookmark the permalink.